"The best thing I did was abuse myself when younger - I dabbled in everything, cocaine, booze, women - because now I don't have to do it anymore." Malcolm John Taylor, better known as Malcolm McDowell (born June 13, 1943) is an English actor with a reputation for playing villainous characters, including his Star-Making Role of Alex DeLarge in A Clockwork Orange, the title role in Caligula, the guy who dropped a bridge on Captain Kirk in Star Trek: Generations (and only took the part because the producers let him drop that bridge), Admiral Tolwyn in Wing Commander 3, 4 and Academy, Metallo in Superman: The Animated Series, and the villain of the Show Within a Show in Bolt. 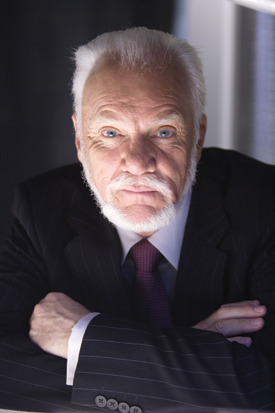 Non-villainous roles include Major Gresham in Aces High, H. G. Wells in Time After Time and Dr. Sam Loomis in the Rob Zombie Halloween (2007) remake. Somewhere in between are Harry Flashman in the film version of Royal Flash and Mr. Roarke in the remake of Fantasy Island. He made his film debut in If..., and his performance in that film convinced Stanley Kubrick to cast him in A Clockwork Orange. It was the first of the so-called "Mick Travis Trilogy", followed by O Lucky Man! and Britannia Hospital, but aside from the main character's name and certain thematic similarities, the three movies aren't really related to each other. In 2013, he appeared in some Sprint commercials with James Earl Jones, reading Totally Radical SMS texts and social media posts, and making them sound awesome. He is also the maternal uncle of actor Alexander Siddig. Malcolm is frequently confused with Roddy McDowall. No relation actually. And note the last name spelling. Halloween (2007) and Halloween II (2009) (the remakes) (Dr. Sam Loomis) He has stated his participation in the potential third film will be dependent on whether Rob Zombie directs it. At this point, Rob has declined to do so. "I've taught you much, my little droogies."